Management seniors Allison Surginer (left) and Samantha Ramos at the 2018 Baylor Business Negotiation Competition. 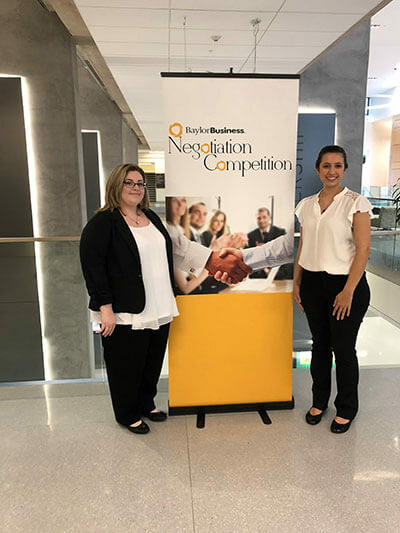 St. Mary’s senior Management majors Allison Surginer and Samantha Ramos finished in third place at the annual Baylor Business Negotiation Competition at Baylor University on April 6, 2018. The competition was for undergraduate business majors and featured 14 competing schools, including Babson College, West Virginia University, TCU and the University of Arizona. There was also international turnout with McGill University from Canada and the SolBridge International School of Business from South Korea participating. Stephanie Ward, Ph.D., Chair and Professor of Management, guided Surginer and Ramos in developing tactics and strategies. At the competition, Surginer and Ramos negotiated against two different teams composed of two people in front of a panel of judges. Each round consisted of 35 minutes of negotiation role play, 10 minutes of judge deliberation and 15 minutes of judge critiques. On the car ride back to St. Mary’s, Surginer said she and Ramos reflected on the experience.